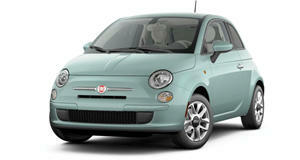 Fiat is previewing what they call the "Fiat 500 Design Collection" at this week&apos;s 50th Furniture Fair in Milan, Italy. The project was undertaken by the automaker&apos;s marketing boss Lapo Elkann and furniture maker Meritalia as part of a tribute to the original Fiat 500. So far, the pieces include a sofa, table, and a console that have all been inspired by the 1970&apos;s 500 model. In what they call the "PIC NIC" table, it uses two front ends of the car glued back to back and is then mounted on two wheels. On top sits a transparent glass fixed to the ground with crystal legs. Black polyurethane was used in place of tires. The "CIN CIN" console is similar to the former, minus the wheels. The top portion is made from crystal and has three height settings. Lastly, the "PANORAMA" sofa has a 500 face with a padded seat and mounted backrest, with covers made from fabric or leather. Fiat says the names of the pieces was inspired by an "open air" vision of the 500, since all three were designed for outdoor use. Pricing has not been announced.